Flambeau Noir: International Left Hand Path Conference is an exclusive, esoterically oriented event inviting rebels and iconoclasts to revel together, exploring the latest in occult philosophy, literature, music, performance and art. The next event will be held in Portland, Oregon USA on the weekend of April 27th to 29th, 2018. 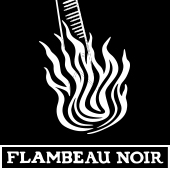 Subscribe to the free newsletter using the form below to get updates and news related to the Flambeau Noir conference. "Darkness Indivisible" sums up the theme of our intention for this year's event, which includes erudite presentations, ritual, live music, kitschy carousal and performances. The fascination is set in motion with The Decent of Ishtar, an initiation rite for Ziggurat of Enki on Friday night, and will continue onward into an illustrious weekend with an awe inspiring schedule of speakers and presenters on Saturday and Sunday. This temporary autonomous portal of incendiary bewitchment will conclude with "Darkness Audible" (the new musical and performative extension of Flambeau Noir) and a luminous line-up of performances by magickal people at The Lovecraft Bar on Walpurgisnacht Eve and a Full Moon in Scorpio.